This event was the first outing for Radio Regen’s new project The Community Radio Foundation – which aims to bring skills and resources to all UK community radio stations to better enable them to raise funds and thrive. 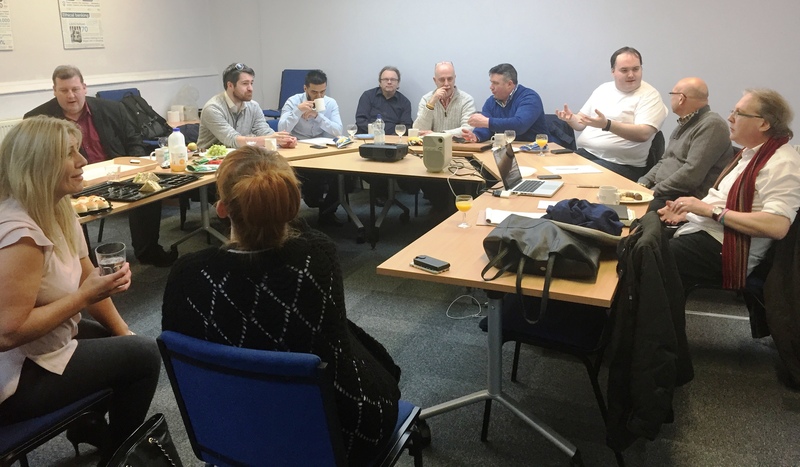 Our task with the workshop was to see what we could do for no budget – quick taster workshops with trainers who either work for us or would like the idea of a partnership. It’s the latter that brought in Alison Surtees from BECTU to talk through Safeguarding for volunteers. Somer Valley FM’s Dom Chambers – who’s also the Project Director of the Community Radio Foundation – told attendees about what he’s finding out about what it takes to have a successful station. Radio Regen’s Cormac Lawler gave the lowdown on Training, and myself and Cathy Brooks (Radio Regen’s Co-Director) ran a session that combined bid writing and governance. We started with lunch and ended up at the pub – so there was a lot of opportunity to chat too. The delegates came from Bolton FM, RadioLaB, Unity (the Birmingham one), Ribble Valley, Erewash, Leyland, Bollington (i.e. Canalside) and Wolverhampton. Some stations were well established and others were either aspiring or heading towards launch. It’s also fair to say that delegates had a good range of expertise – from radio to finance to business coaching – in other words pretty representative of the sector. ‘Can I also encourage people to go on these get togethers. They are a learning tool for both novices and veterans. Certainly as a veteran you will find (as we did) that we just might have taken our eye off one or two things. We need to do a few minor tweaky tweakies at this end. If you don’t attend these get togethers there is a chance you may completely miss something and the back wheels might come off your cart. If you are a newbie, a novice or even thinking about getting stuck into a Community Radio venture for the first time, this is a fantastic start. Learn what works, what doesn’t work, what will work if done correctly, what will be a complete horlicks if not done correctly.